With the result of the Brexit referendum, the future of the EMA’s London headquarters was cast in doubt. Now, 19 EU member states are bidding to become the new home of the agency. It's now only one week away from the decision as to which city will host the agency and the competition is fierce. Hosting the European Medicines Agency’s headquarters comes with a raft of benefits: 900 highly-skilled employees, 36,000 experts visiting each year and an annual budget of €322 million. It is easy to see why the agency has a long list of suitors – specifically, 19 of the European Union’s 28 member states (pictured below). A decision will be reached on the final destination for the EMA at the General Affairs Council held in November, with the choice being made public on 21 November. Each member of the EU will cast its vote, made particularly interesting as the 19 contenders will have to choose between each other. The voting will take place by secret ballot and will be held consecutive rounds, if needed, until there is one clear leader. There is another agency that is also set to leave London, with the European Banking Authority also set to leave London for a new home. The financial institution was set up after the financial crisis, in 2011, and is seen a prestigious coup for many of the countries that have a strong financial hub, such as France and Germany. It has led to a number of cities bidding for the authority, and some have even chosen to put forward prospective bids for both (see above). The political machinations have already begun, Eurovision-style, with the Greek Alternative Minister of Foreign Affairs suggesting that countries neighbouring or nearing Greece (Cyprus, France, Italy, Malta, Portugal, and Spain) should vote for each other in the first round of voting. The intention of this tactical voting is to keep votes, in the first round, within their area of Europe before the later rounds push on to find one candidate supported by 14 member states. With such a valuable prize on offer, the vote is sure to unearth some tensions that lay beneath the surface; there has already been one major cause for acrimony, as the UK and the EU wrangle over the price of the EMA exiting from its shores. The cost has escalated massively due one factor: the 25-year lease signed by the EMA when it entered its residence in Canary Wharf three years ago. The main issue? There was no release clause from the tenancy. This means the cost the relocation is likely to set the UK back £520 million, with 60% arising from it being forced to pay up the rest of the EMA’s rental contract. Another point of contention comes from members of staff that currently work at the headquarters. The EMA has warned that 667 out of 890 members of staff did not want to leave London, while leading politicians have called for British business and the UK government to actively recruit from current staff. Loss of staff is a major worry for the EMA, as it looks to ensure that services are not disrupted with any transitional move. On its list of six criteria that must be addressed in countries’ applications, the first is the member state’s “plan for when and how the relocation should take place and how this plan would ensure the Agency remains operational”. In a recent interview, Guido Rasi, Executive Director the EMA, expressed that is major fear about the transition was that there would be a major public health event that would occur during the transition. The potential for this is small, but the amount of individuals that could be impacted across all of the member states would be huge. The inevitable move has already had an impact on the EMA, forcing the agency to suspend activities in several areas in order to focus on the transition plan. This includes halting development of the European Medicines Web Portal, an online information source on all medicines marketed in the EU, as well as halting e-submissions project portal and the development of a transparency roadmap. It has also resulted in cost-cutting measures, to conserve funds for the move, and also redirected a significant amount of people-power to plan for the move. These issues will not be of any concern to the applicants, at this point, with the main focus on luring the agency to its borders. In order to learn more about the ambitions of the competing nations and the unique offering that each brings to the table, Pharmafocus spoke to leading figures from four of the hopeful bidders to provide a snapshot of the major talking, and wrangling, points that may lead to success when the vote comes round. How long after the vote did Denmark decide to apply to provide a home to the EMA? Already shortly after the vote, on June 23rd, we started looking at the opportunity of bringing the EMA headquarters to Denmark. However, it was relatively unclear then what Britain really wanted after the vote, until January 2017 when Theresa May outlined that the UK was looking to leave the single market and then it became clear that the EMA would need to find another home. This is when we made public that we had an interest in hosting the EMA but, at that time, it was not very clear what criteria the agency was looking for. This period started the preparatory work and led to our eventual application at the end of July. What were the primary reasons for Denmark applying? Denmark has a national strategy of developing the life science sector and we have, like the UK, although on a different scale, a very vibrant industry consisting of several global pharmaceutical companies, but also medtech and biotech companies. So much so that we are one of the largest European exporters of medicine, much larger than our size would indicate. We have a strong industry, we have a strong academic tradition, both in academia and public health administration, and, based on that, we believe it’s a phenomenal opportunity for the EMA to come to Copenhagen. As well as this, Denmark and Copenhagen could benefit strongly from the EMA’s presence. What does London stand to lose and Copenhagen to gain? I think we can say that the EMA has been very happy to have been located in London and so it’s going to be a huge task for any location to replace London – there will also be significant disruption in the process. What we hope to gain for Copenhagen would be the creation of 1,000 high levels jobs in life science and regulatory affairs. This would further strengthen our life science ecosystem – creating job, creating opportunities for Copenhagen as city, with the number of visitors who travel to the EMA each year, and the economic benefit that it would bring. On a more basic level, a pan-European institution, like the EMA, would fertilise the international environment in Copenhagen. What does Copenhagen offer uniquely to attract the agency? I think the liveability of Copenhagen is very high and the productivity is extremely good. Some Central European countries would say that Copenhagen is somewhat on the outskirts of Europe but we have been blessed by being able to find a specific location for the EMA that is five minutes from the airport. If you take the length of commute, from doorstep to doorstep, it would surpass most other locations in Europe. Is the Copenhagen Centre for Regulatory Affairs ready to cope with the extra workload? It is clear that the EMA, with its location in London, has benefited greatly from the MHRA so already now we have expanded the Danish Medical Agency. This means it can now take on more work than it would otherwise be doing, managing applications and administration of new drugs, and this is already being planned as we speak; further expansion may be warranted. We have already started a department in Copenhagen University for regulatory science and that will be expanded should we become host city. Of course, the UK medical agency is larger than the Danish agency but we are expanding in the potential for us to support the EMA in their function. How will the transition impact medical products approval? How will Copenhagen minimise that? The one thing that we have highlighted, and what the EMA is looking for, is to only consider locations which the staff would find attractive, so that as many relocate as possible. A good transition plan, as I’ve mentioned already is important. Finally, it is important to have a local ecosystem to recruit people to fill vacancies. This highlights to us that there are only six or seven applicants who have applied to host the EMA that would be able to live up to minimising the disruption the business of the EMA. I could be concerned about some locations where you could see an exodus of staff, as it would be unattractive to move to, and locations where it would be difficult to replace these individuals. Why did Finland choose to offer to host the EMA? It was clear from the beginning that Finland can offer a perfect location for EMA. We saw this as a great opportunity to enhance the EU’s global regulatory competitiveness by locating EMA to Helsinki, where the European Chemicals Agency (ECHA) is already operating. In addition, the Helsinki region possess top class expertise in the life sciences, in terms of a high-quality talent pool, world-leading research, strong support services, and functioning networks of collaboration among academia, industry and the public sector. All of this supported the decision to apply to bring the EMA to Finland. The official decision was made in the spring of 2017. What does hosting the headquarters offer Helsinki? Relocating EMA in Helsinki would not only benefit Finland, but the whole of the EU, as Finland can offer synergy with ECHA and the Finnish expertise, which is very strong in the health and medicines sectors, especially in the fields that are important (biobanks, genome research, biomedicine) in the future. Our key advantage is that everything simply works here. Helsinki is a perfect combination of effectiveness, smoothness and high quality of life. As everything works smoothly, people also have more spare time, which is important from the point of view of the families of EMA employees. What are the attributes for the city that will be the home of the EMA? There are six main criteria for the EMA headquarters’ new home and Helsinki possess all of them; they are related to accessibility, services for EMA families, business continuity, geographical issues etc. But the most crucial criterion is the ability to get the job done smoothly. The agency must be up and running from the date of the UK’s withdrawal from the EU. Helsinki can make this happen. Could you identify Helsinki’s unique attributes? 1) EME and ECHA synergy. We are competing globally. EU has the possibility to create the world’s most competitive regulatory agencies by locating EMA and ECHA in the same city. This is our chance to take the leading position. 2) Smooth transition. Finland is known for getting the job done. 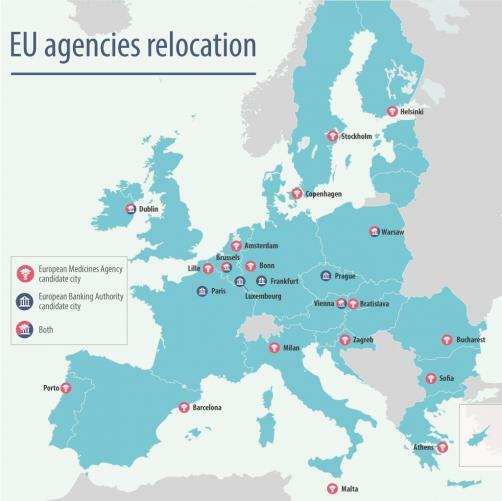 Relocation cannot disturb the EMA’s daily operations, which might potentially put European public health at risk. We can relocate the EMA directly to its new permanent home and guarantee the continuity of daily operations during this relocation. This encompasses employee retention, supporting the personnel base with an abundance of local experts and the provision of a detailed relocation plan. Helsinki is also easy place move in to. Helsinki is much more international than one might think. About 15% of the population in Helsinki is of foreign origin and more than 200 languages are spoken in the city. What really stands out in Helsinki is the ease of working and living here even without knowing the local language, it is entirely possible to use English everywhere. 3) High quality of life. Finland ranks as one of the happiest places on earth, and this holds true also for expats. Expats’ happiness in Finland has soared in recent years, as expats report being especially happy with their jobs and careers, work-life balance, and job security. Expats consistently consider Finland to offer the best family life, best availability of childcare and education, best quality of education and best possibilities for family well-being. Helsinki is at the top of global liveability rankings. The latest was published by Economist in August 2017, where Finland was the only Nordic city in top 10. Finland has tremendous strengths that make quality of life here extremely high. Safety, security, cleanliness, education, healthcare, infrastructure and how well everything functions are the basic building blocks of this high quality of life. 4) The Finnish expertise. Finland would be a vibrant and forward-looking environment for EMA and Helsinki would drive EMA’s technological development. Finland will also leverage the expertise and experience of its own national medicines FIMEA, which is a recognised regulatory agency among the European agencies. We are a forerunner in personalised healthcare and medicine. Helsinki is one of the leading cities in having high-quality and comprehensive health data in digital format, universal identification number and innovation-friendly regulation. Finland was the first country in the world to pass specific and comprehensive biobank regulation. When and why did you begin work on Stockholm’s application to home the EMA headquarters? • Synergy effects with the European Centre for Disease Prevention and Control (ECDC). Geographically, Stockholm being located in Scandinavia means officials looking at moving with the agency would be faced with a move further afield than other locations – do you believe this is an issue and, if it is, what can Stockholm offer to mitigate this? Sweden has excellent direct links by air between Stockholm and the capitals of other EU Member States. There is also a willingness to further increase the number of direct flights based on the needs of the EMA’s 36,000 annual visitors if the EMA relocates to Stockholm. When you land, it takes only 20 minutes from Stockholm Arlanda Airport, to central Stockholm and once there, Stockholm has Europe’s best public transport system ensuring quick and easy transports within the region. What does London stand to lose and what would Stockholm gain with the EMA headquarters? We focus on Sweden and on Stockholm, and for us the relocation of the EMA to Stockholm would mean a great deal for the hospitality industry but foremost it would give synergy effects between the EMA, the Swedish life science sector and with the ECDC. The cooperation would ultimately also benefit the patients in the EU. From speaking to officials at the EMA, one of the major concerns expressed about the move is the uncertainty for their partners and children, with some suggesting that they may try to remain in London for this reason. What would Stockholm offer to smooth the transition? Sweden is extremely well-placed not only to receive the EMA’s employees but also their family members. With setting up an accredited European school, a One-Stop Shop for assisting EMA employees and their families on issues that may arise when moving to Stockholm, an expat program for staff and accompanying family members to ensure a good and meaningful life in Stockholm, and an extremely strong labour market in the Greater Stockholm Region. Beyond the move for families of employees at the EMA, there is the question of how the transition will impact on patients’ access to medicines – how will Stockholm ease this process? This has been one of the main strengths of our candidacy; we have really worked on trying to put forward a smooth transition plan. Stockholm offers particular initiatives to ease the transition immediately following the decision; Sweden would immediately assist the EMA in finding premises in central Stockholm for the EMA’s transition team and we plan to have a one-stop-shop set up to coordinate the Swedish work on the EMA’s various relocation issues. Were the EMA to relocate to Stockholm, the Swedish Medical Products Agency (MPA) would be tasked with assisting the EMA – for example, by providing training where necessary. MHRA takes a lot of work of the EMA, how will MPA cope with the increased workload? The Swedish MPA is the EMA’s second most active partner, after the UK. We think that after Brexit, the MPA is prepared to shoulder 10% of the UK’s workload. If Stockholm was selected, we would also consider carrying out unfunded duties performed by the UK. I think we are very well-equipped to handle the situation. Are there any other unique factors that indicate Stockholm should become the home of the EMA? We have noticed that the EMA wants the bidding countries to clarify their position on LGBT rights and this is an area we have already made a lot of progress in. I would just like to emphasise, on that issue, and on behalf of the Swedish government, that Sweden is one of the strongest countries in this respect. Of course, we are not completely satisfied and will continue to work on equal rights, but we already have equal marriage and also, just recently, had the first gay couple adopt a child from abroad. We are also currently working on strengthening transgender rights. This is a really high profile issue for Sweden and has been for a long time, I would like to emphasise that Sweden is a really open and welcoming country. Was it an immediate to decision from Austria to jump into the EMA headquarters race after the result of the UK’s EU referendum? Following the vote for Brexit, we started to internally think if we should apply, and we started the work around January this year. It was a lot of work; we had to communicate with all of the different ministries, and we made our first printed proposal in May. We received the notice outlining what is being requested regarding the EMA relocation, so we made an additional proposal which we put in at the end of July. For this second proposal, we put everything together and made an offer on the financial side which we think is very attractive – we will take over the rent of the EMA if it is relocated to Vienna, as we hope, for 25 years. Here, we are more generous than, for example, our Danish friendly competitors, who will take over for 20 years. This is important because, unfortunately, to my great sorrow when Britain leaves, the EU loses its budget contribution. What key offerings do you have on the table as part of your bid? We have selected the building sites – at first we had 12 different candidates, but now we’re focusing on two sites which match the requirements by EMA. I have been three times to London and looked around the EMA headquarters, and we made all the efforts to be able to match what they have there – including conference facilities, the break room, as well as the office facilities for employees. Our key offerings will look at the question concerning the well-being of the EMA collaborators. We have decided to establish a kindergarten in the premises itself. Why? Because the employees of EMA are international civil servants, and in the European Union they have to work up to six or seven years at 40 hours a week, and they have to return to the workplace six months after giving birth. This is quite demanding, so they need they need these services in the same building where they work. Do you think putting EMA employees at the forefront of your offering will give you the edge in the final decision? It is the ambition of the EMA to close down its computers at 6pm on Friday in London and restart them in London at 9am – due to their deadlines, the work must continue. EMA is a very important agency, dealing with 26% of all authorisations for new medicines and drugs, and so the medical well-being of all of our societies within the European Union is very much interdependent. So in the interest of our citizens, we want to offer the best possible conditions. The EMA has a strong, professional staff consisting of very highly qualified people, and we want to make sure that they would also feel very happy in Vienna, because you could say employees are the crown jewels of the EMA. If they don’t move with the organisation to the new premises, the EMA will lose out, but so will all of our health systems, so for us it is very important that we are able to offer these conditions. What core elements do you think makes Vienna the ideal destination for the new headquarters, and what would it mean if you were to win? We think Vienna would be the best place to locate the EMA. We are an international convention centre, and with all the infrastructure, conference facilities and cultural facilities, we would be ideal. We have a location in the centre of the European Union and we can be reached daily by all capitals in Europe, even by those flying in from the Atlantic, Trans-Atlantic, or Pacific areas. The life sciences industry is, at this time, really moving to the centre of society. We are all getting older, and we should get to stay older and healthier, and life sciences will play a much bigger role in our society in the future. We are now entering a real kind of revolution in areas, such as cancer, and we are expecting much more development. The EMA needs to be able to administrate that and push forward the frontiers.